Where does one begin when one talks about dim sum? Dim sum is more than just delicious bites. It's the kind of dish that you’ll crave when you’re living abroad. It’s also a way of life for the locals, a ritual that brings families together during the weekend and holidays, and a daily habit for the grandpas and grannies in Hong Kong. The word, dim sum, literally means touch upon the heart in Cantonese. As the dishes are often served in small bites and meant to share between the group, I often refer them as Cantonese tapas to my guests. Some of my fondest childhood memories was ordering from the dim sum aunties who pushed their steamy carts around in the restaurant. The majority of Chinese restaurants in Hong Kong have replaced the symbol of dim sum with an a-la-carte menu, which is definitely a lot less exciting. Who wants to order with a piece of paper and pen when you can take your pick at the bamboo baskets in the trolley? Whether you’re a dim sum amateur or about to lose your dim sum virginity, these tips will guide you through the basics and how to enjoy dim sum the best way. The server will ask you what kind of tea you’d like to have as soon as you get seated. While jasmine is a popular choice among Westerners, I’d suggest trying other varieties. If you’re a coffee drinker, go for iron buddha/Tik Kwun Yum (Cantonese) / Tie Guan Yin (Mandarin), a roasted oolong with a sweet finish. Feeling a little adventurous? The locals, especially the grannies and grandpas, love pu’reh. 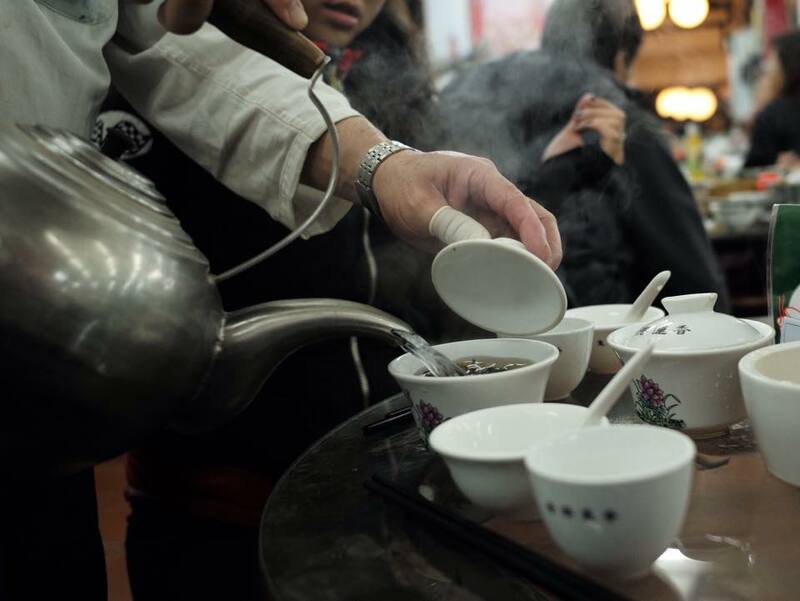 Pu’reh is a Chinese black tea that’s known for its rich, earthy taste and helps reduce blood cholesterol. Also order a pot of hot water beside the tea. Locals often use it to dilute the drink a little when the tea has been steeped in the teapot for too long. Your server will start off your meal by dropping off a bunch of chopsticks, bowls, as well as a medium-sized bowl. Most tourists can’t wrap their heads around what the bigger bowl for, and it’s used to rinse everything in it with either hot water or tea! The older generation believes that washing utensils in hot water can help kill germs. While that’s not very valid, doing so gives them a peace of mind and locals still do clean everything before they eat as part of the ritual. Many of my American guests love adding soy sauce to everything they eat, but I urge you to give the food a go first without adding more seasonings. Most kitchens already have their dim sum well-seasoned, so there’s no need for extra (except one occasion. see next tip). Instead of pairing food with Sriracha, the Cantonese loves dipping their har gow (shrimp dumplings) in spicy, fiery chilli oil. Ask the server to bring you some and give your food an extra kick. However, the spiciness of the chilli oil varies depending on the restaurant. My advice is to give it a try first, take a lick with your chopsticks to test the spiciness before dipping your food in it. If you forget to do it and end up setting your tongue on fire, there's nothing much I can do to help! It’s just simply impolite to double dip, especially in our culture. If you find it inconvenient, ask the server to bring you an extra serving of sauces and light your tongue on fire until your belly and heart are content. In our culture, the younger ones at the table often serve tea to their seniors out of manners and respect. Locals also like to knock on the table with their knuckles twice whenever someone pours tea for them and there’s a story behind that! They say that a Chinese Emperor went in disguise to see how his people were living back in the days and when he was dining with his servants, he poured a cup of tea for one of them. In order not to blow the Emperor’s cover, the servant used his knuckles to represent the customary bow (as they had to be on their knees when they bow to the emperor) to show his gratefulness. There’s no need to ask the waiter to come over for a refill. Simply leave your teapot open, and the waiter will spot it and bring a kettle over for a second brew. While most Hong Kongers are always on the go and everyone walks in a quick pace, dim sum is one of the few occasions that it's perfectly fine to relax, lay back a little and enjoy a meal. Sometimes people can take up to 2 hours having dim sum, just because they love taking their time. Chinese uncles, grandpas and grannies love going out for dim sum early in the morning by themselves and you’ll often find them reading newspapers or chatting with other regulars at the same table. Besides, it's common to share the table with strangers and dim sum restaurant is probably the best place for you to practise the art of dining alone in Hong Kong. Some restaurants also open as early as around 6am. If you find yourself hungry and jet-lagged, why not join the uncles and grannies for some treats? If you're looking to experience Hong Kong in the most authentic way and get whisked away to hidden gems that only locals know about, book one of our tours with Ashley!